Each one of you will have your set of favorite web applications or services which we wished were always accessible in a much intuitive way. Opening websites in your native browser doesn’t always give a better experience than using respective apps. Twitter being the right example. 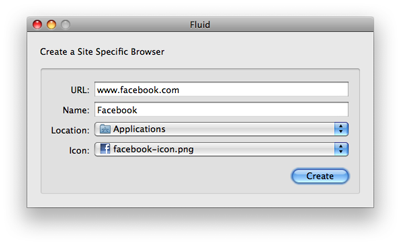 Fluid for Mac is a free application that helps you create Site Specific Browser (SSB) thereby turning your web apps to desktop apps. This project as reflected on the app was influenced by Mozilla Prism project and Adobe Air. Inorder to have fliud app running as your desktop application enter the website’s URL, name and choose an icon. Once done click “Create”. Now your favorite website will been converted into a native Mac desktop application that appears in your Dock. Download Fluid for Mac now.